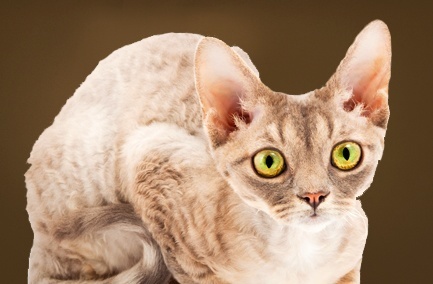 The Devon Rex is a breed of unique appearance. Its large eyes, short muzzle, prominent cheekbones, and huge, lowset ears create a characteristic elfin look. A cat of medium fine frame, the Devon is well covered with soft, wavy fur; the fur is of a distinctive texture, as the mutation which causes its wavy coat is cultivated in no other breed. The Devon is alert and active and shows a lively interest in its surroundings. Devons differ from Cornish in their wavy coat (vs curly) and long hair on their tails. There is a muscle disorder called “Spasticity” that is very similar to muscular dystrophy in humans. As well, Devons can inherit a rare type of bleeding disorder.